If you've been sifting through Netflix, searching for something spooky, but not too spooky; something like The Great British Bake-Off, but more seasonally appropriate; maybe the kind of thing Martha Stewart would make if she had been obsessed with Labyrinth -- you might land on a show called The Curious Creations of Christine McConnell. You might watch the autoplayed trailer and wonder, "What is this? And who is this person?" You might Google her name and discover her Instagram account with more than 300,000 followers, her marketing partnerships with major movie studios to promote titles like Alien: Covenant, and her collection of the most enviable cinched waist dresses you've ever seen. How in the world did an Instagram baking star with a flair for the grotesque land a homemaking show on the biggest streaming service? "People kept saying yes," McConnell tells Thrillist as she describes the planning process behind Curious Creations. Netflix was one of a few outlets that approached her with an intriguing idea about filming a cooking show comedy, and after multiple meetings with Netflix, production company Wilshire Studios, and the Jim Henson Company, the idea finally came to fruition after about a year of workshopping the concept. Christine McConnell, in character as a darker, more fantastical version of herself, hosts the show out of a cozy, brightly lit kitchen, where she cooks, bakes, crafts, sews her own dresses, and manages the menagerie of puppet creatures that live in her house. "You know, I thought it would be weird," she says, "because there are about three people per puppet on set, pretty much. But they look so real! Their faces move, their eyes are moving and blinking, so you believe that they're real, even when you're sitting there watching it happen." What on Earth Is This Trailer for Netflix's New Goth Cooking Show? 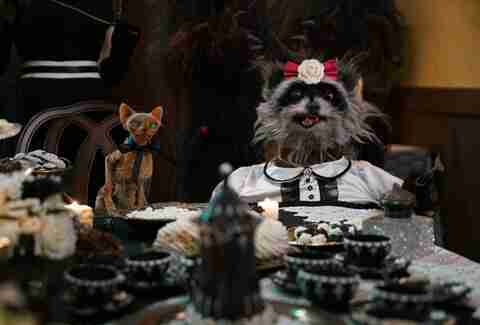 Rankle, a mummified sphinx cat, Rose, an undead raccoon hybrid with a crooked fork for a left hand, and Edgar, a tall, bushy-tailed werewolf, comprise the trio of wisecracking beasts constantly at the throats of each other and whatever guests McConnell invites to feast on her creations. Rose is a particular standout, with her bright pink bow and loud personality. "I'm in love with Rose," McConnell says. "I don't have children and she's like the child I would want. She's this beautiful, mangy little creature. I feed actual raccoons outside my house every night, and she's the embodiment of them, just with talking." The show, like McConnell herself, is an amalgamation of a number of genres: There's a loose plot that weaves itself in between irreverent segments showcasing caramel spiders and eyeball cookies, and a number of recurring characters including a hunky love interest, a homicidal sister, whispers of a serial killer on the loose, and a ghost played by Dita Von Teese, whom McConnell counts among her friends in real life. Curious Creations is part-DIY show, part-fantastical comedy, and perfect for anyone intrigued by the strange and unusual. McConnell began her career as an Instagram-famous creator of the strange and unusual with a familiar kind of epiphany. "I'm trying to think of a really nice, diplomatic way to say it," she explains, "but, I was a bad secretary and I got fired, and I was like, this isn't working. Baking was just a silly, fun hobby that I started. My dad, at one point, talked to me and said, 'There's no money in cakes, it's not gonna pan out.' My mom is very supportive and encouraging, and she told him to shush." She actually didn't start baking seriously until she saw Quentin Tarantino's Django Unchained, whose white cake scene inspired her to go home and whip up the same layered, frosted confection for herself. From there, it was just a matter of finding her own aesthetic, going viral by decorating her parents' house with giant eyes and a mouthful of teeth for Halloween, and the people of the internet started clamoring for more. The Instagram fame is still a little bewildering -- "In real life, I don't think I know more than 50 people" -- but the joy of making something and showing it to a crowd of people is something McConnell has had all her life. "Ever since I was a little kid," she says, "I loved creating weird bits of art, hiding in a room and doing it and then bringing it out in the living room and showing everybody. Instagram is just the same format, essentially, just with so many more people." Her favorite creation on the show is also one of its most ambitious: a giant, intricate gingerbread house that seems to come together in less than 10 minutes in the final episode of this first season. "I was working on that for, I wanna say, three or four days nonstop, not sleeping," McConnell says. "I still look at the pictures and I still can't believe that looks OK."
So, how long do her intricate projects really take? "It's sort of the joke of the show that things are done in, like, two seconds," she says, laughing. 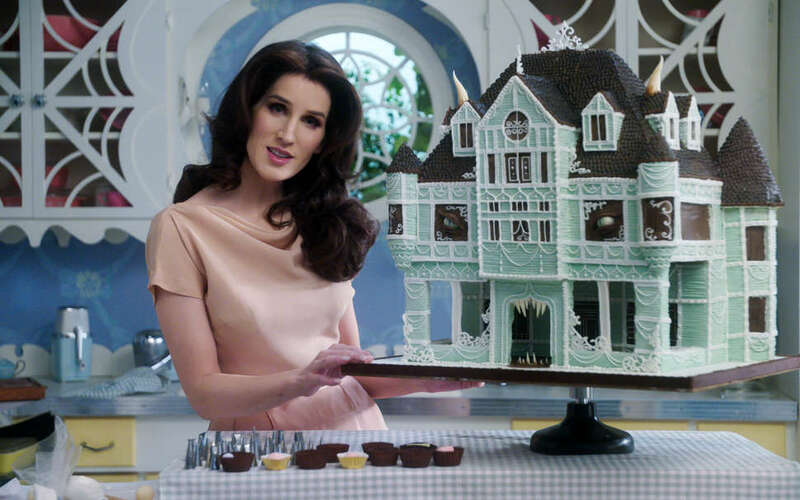 "I once spent a month creating a gingerbread castle. That was the longest I'd ever spent on something, and then obviously, by the end, nobody wanted to eat it." As for things that people are supposed to be able to eat, she'll make them in mere days. "I did a Queen cake a month ago and it was for a big event, so I punched that thing out in five days of working 15 hours a day -- and working out of a refrigerator, because it has to be cold and fresh." Her all-time favorite is much simpler: a photo series featuring a recreation of Gingy, the tremulous gingerbread man from the Shrek movies. "That's one of the projects that is so simple, it's not even that complicated, but every time I look back on it, I laugh and it makes me so happy." Some of McConnell's most well-received posts have been irreverent photo shoots with Jason Voorhees from Friday the 13th and the Facehugger alien from Alien, a creature McConnell has dubbed "the scariest creature ever created by a movie studio. People have a visceral reaction to it. And I thought making a cookie out of it would be funny. It's still scary, but it's funny too." When asked to describe what exactly her own aesthetic is -- is it goth? soft goth? steampunk? -- she has to think for a moment before referencing Tim Burton's dark fantasy-romance Edward Scissorhands, an obvious touchstone. "I feel like so much of my style and creativity was born out of that world. Winona Ryder looking like this pretty pastel person juxtaposed next to scary things -- now, obviously, this is a fantasy, this is not reality, but my dream is to be a combination of those two main characters from that movie." For McConnell, playing around with horrors is exactly what makes her job so much fun: "Life is dark and scary, and there's terrible things that happen, and I feel like having fun with those things makes them less scary for me. That's why I like the creepy stuff."